With their natural light and tranquil, ‘back to nature’ feeling, Solardome® geodesic domes create a wonderful restorative environment. Our domes provide an innovative approach to therapeutic and rehabilitation centres in the wellbeing and healthcare sector. Care homes, hospitals, retirement villages and healthcare providers are being encouraged to take advantage of the outdoor environment in the shape of a garden. A dome is ideal for patients and residents to take in fresh air, exercise and sunlight whilst still in a sheltered environment. 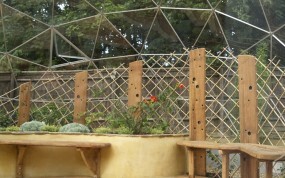 Our domes make excellent horticultural therapy hubs, hydrotherapy rooms and can add a functional and stunning focal point to existing outdoor rehabilitation areas. Solardome® geodesic domes are also being used by several of our customers for Reiki and Yoga, healing and therapy sessions. They are also used simply as a tranquil, calming spaces in which to relax and reflect in healthy natural daylight all year round. Where space is at a premium, creating a multipurpose outdoor room that can allow for residents to safely enjoy recreational activities or provide a break away space for patients and visitors a dome is ideal. It is quick to install, spacious, long-lasting and low-maintenance making it a very efficient use of space. Depending on your project, you can choose from our standard commercial domes 3.6m-10.1m diameter, or for larger projects we have our SOLARDOME® PRO architectural system for domes ranging from 7.2m-25m diameter. Alzheimer’s Society (2013) Staying involved and active. Britton B (2012) The Sun is out! Pugh R (2013) How gardening is helping people with dementia. Thrive (2013) Tips for easier gardening. 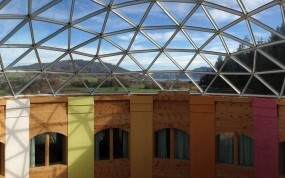 The skylight requirements were to provide a central feature, maximum light, complete weather protection from the high winds and snow loading of the Austrian climate and fit over the atrium of a unique 12-sided building. Patients using the rehabilitation services at Mandalay House now have an exciting new outdoor space to use, thanks to a £35,000 project to improve their environment. 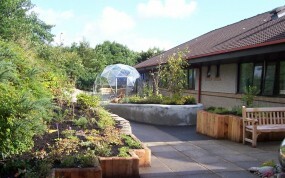 Dementia patients on the Clisham Ward at the Western Isles Hospital at Stornoway now have improved access to the outside world and a greater degree of independence, thanks to a special garden created to improve their health and wellbeing. Our visitor book is full of guests' comments about the 'awesome' dome.